With the quite tubular muzzle elongated to house the extremely long tongue, the profile of anteaters is quite recognizable. The terrestrial Giant Anteater has a stiff, heavy brush tail. The hair, generally, is straw-like bristles, with those on the back and tail being quite long. Even though all five toes are present on the fore-arm, the first and fifth are greatly reduced and are not visible. Two of the front toes are very large and heavily clawed, the third toe twice as long as the second. All of the toes are folded sideways, the animal walking on its knuckles and the side of its fist. The much smaller Tamanduas are very similar, except they have a shorter face, 4 toes (and claws), not 3, and a prehensile tail. The Giant ranges south to Uruguay and northwestern Argentina, east to the Andes and north into southern Mexico, foraging the grasslands, open dry, deciduous and rain forests. The Tamandua needs trees and is less likely to be found in the open. The same broad range of the Giant is roughly evenly divided between the Northern and Southern Tamanduas. Wild – Ant species without heavy jaws or chemical defenses, like carpenter ants, and worker termites, some 30,000 per day. They also slurp up honey and fruit juice. Zoo – A gruel of Bird of Prey meat, fruit cocktail and yogurt, with cricket legs mixed in. Cricket legs are pinched from the crickets fed to the animals in the Reptile House. Cricket legs have sharp spines and cause irritation in small-animal stomachs, but serve perfectly in providing necessary roughage for the anteaters. Giants are gray-brown, with the bristly crest and arm hair finely banded. There is a black, or dark mark across the chest, up over the shoulder and along the back. Tamanduas are silky-blonde with black marks on the shoulders and around the eyes. The black of the shoulders runs up into a black “V” on the back of the Northern Tamandua. The eyes and little nose-pad are black. All anteaters use the same fear-defense posture, rearing onto hind legs (Giants use their stiff tails as a tripod leg, Tamanduas and Silkies support with their prehensile tails) and brandish extended claws. The forearms are very powerful (one swat can break a human’s arm) and the hands are modified to provide tremendous leverage power. The digits and claws are heavy, and are constructed so that the huge claws may be folded against the palm when not in use. Animals, including humans, caught in their claw-grip, succumb. The claws, used to rip open concrete-hard termite and ant mounds, can cause tremendous damage. The anteaters walk on the sides of the fist to avoid stabbing themselves or dulling the claws by stepping on them. The sense of smell is important to all anteaters, the species of ants and termites are identified by smell before the nest is ripped open. Anteaters seldom spend more than a couple of minutes feeding at any one termite or ant nest. Only a few thousand insects are removed at one feeding and then the nest is abandoned to repairs. The anteaters circulate around their territories, feeding lightly here and there, never destroying any one nest and, therefore, never eliminating any of their food-base. Termites and ants recover losses very rapidly. Anteaters, like sloths, have a very slow metabolism, maintaining a low body temperature and sleeping a large portion of the day. Giant Anteaters dig a depression and curl up in it, covering themselves with their brush tail. They are diurnal if it is cool and nocturnal if it is hot. Taman-duas curl up in tree notches or hollows. Excellent hearing awakens them at the slightest sound. Anteater mouths are very small, barely big enough to pass a pencil, but the tongue is very long, protrusible (to 24 inches in the Giant, the Tamandua, 16). It is heavily coated with thick, sticky saliva. The tongue has backward-pointing papillae that can be stiffened into spines. It is attached, muscularly, to the sternum and can be flicked in and out at the incredible rate of 150 or more times a minute. Insects are mashed against the hard palate. Most mastication (grinding) occurs in the gizzard like stomach, aided by ingested grit. Normally solitary, anteater courtship is not documented in the wild. Breeding probably takes place during a brief encounter. Gestation is about 190 days. The newborn climbs through the fur onto the mother’s back and she then licks it clean. Usually there is only one precocious youngster, which is suckled for about six months. The youngster usually stays with the mother until nearly fully grown, about two years. Length 5 to 7 feet long. Weight 40 to 100 pounds. Diet Ant species without heavy jaws or chemical defenses, like carpenter ants, and worker termites, some 30,000 per day. They also slurp up honey and fruit juice. Habitat Grassland savannas, swamps, humid forests, and woodlands. Tamanduas are IUCN listed as Least Concern, but the Giant is Near Threatened and considered vulnerable to habitat destruction. 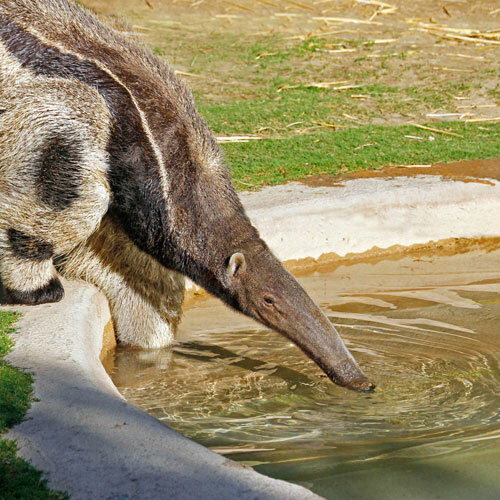 Anteaters have a very slow metabolism, maintaining a low body temperature and sleeping a large portion of the day.